While many brands often seek to dress the beautiful women in front of the camera, Toronto based luxury shoe brand Zvelle, is focusing on the women behind it. As a female entrepreneur in an often-male dominated world, Zvelle designer and CEO, Elle was inspired by this year’s female filmmakers. “We all know that women face an uneven playing field in many industries: film being one of them. I have always been an action-oriented dreamer and I believe that small change can lead to big change. As a matter of fact, I believe that if we want to see better stories on the screen or in life, we need to encourage and celebrate the women who have the courage to lead such paths,” stated Elle in a recent letter to her customers. 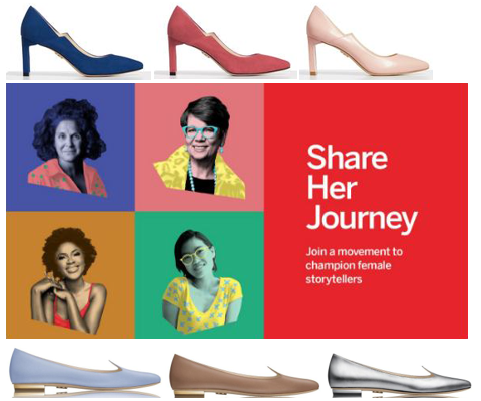 In honor of this year’s Toronto International Film Festival and these women, Zvelle will be donating 10% of all proceeds from their Rayna and AVA styles, during the month of September, to TIFF’s Share Her Journey Campaign. Share Her Journey aims to increase participation, skills and opportunities for women behind and in front of the camera. In addition, Zvelle has dressed many of the women behind the scenes for this year’s TIFF including influential directors’ Mary Harron, Molly McGlynn, Erika Olde, Jennifer Baichwal and more.